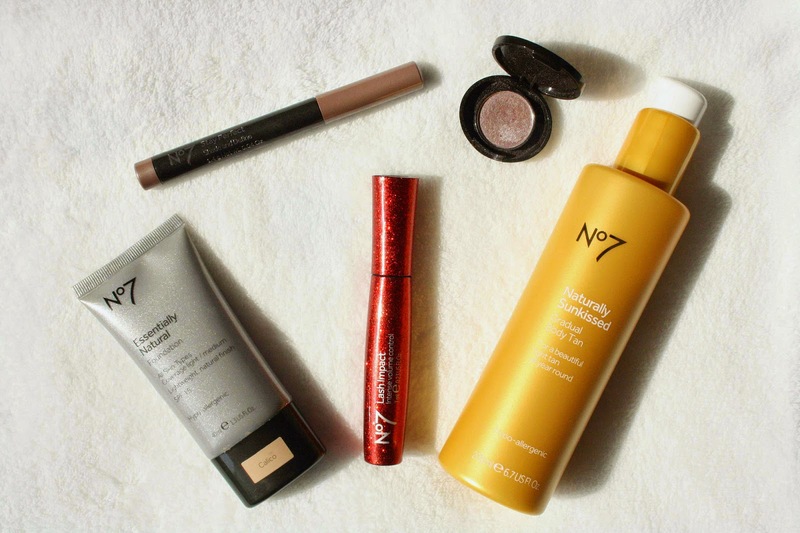 I think No7 are an underestimated brand of cosmetics. They’re not a super cheap brand to say the least, however they’re not up there with those high end products. I own quite a few things from No7, as in Boots they always have deals and offers on their cosmetics and I mean who can say no to £3 off make up?! These are my top 5 favourites from No7 that I own, that I think are worthwhile! I hope you find something new to try out. Also I will be doing more posts focusing on one specific brands and my top 5 favourites, hope you enjoy. First off, the product I’ve had the longest is No7 Essentially Natural Foundation in Callico. This retails for £9.95 which is a very reasonable price. I like how this is a light/medium coverage foundation, so I can wear it on days I don’t want my face to feel ‘heavy’. However its quite a pink toned foundation, my skin tone is more on the yellowy side of the spectrum. But I do enjoy wearing this foundation as it feels quite weightless on the skin and definitely gives a natural glow! The next product is the No7 Lash Impact Mascara. I have previously done a full review on this which you can read here. This retails for £13.50, which personally I think its overpriced for the quality. Out of all 5 products this is my least favourite, but I still think its a reasonably good mascara. I like the wand applicator on this, it really separates the lashes well and gives good length. The only down side to this is that it doesn’t hold a curl all day, and leaves quite bad black marks under the eye. I think this would be a good mascara to wear on a night out however, where you’d be wearing it for a shorter period of time. One I’ve only been using recently is No7 Naturally Sunkissed Gradual Tan. This retails for £9.95 which is pretty average for a fake tan based product. I am not a fan of fake tan and have never used the stuff, but I’m so pale I really needed something to help give me a natural looking tan, so I opted for this. So far I’d say so good. You use it everyday and the tan gradually appears on your body. I enjoy using this a lot as it gives a natural tan to my skin, which I prefer much more to having a full on tan that probably would look seriously fake on my skin. If you’re looking for a gradual tan this is a great one to go for! I honestly love this next one, No7 Stay Perfect Shade and Define. This is an eye shadow stick, and its honestly the most beautiful shade I’ve ever seen. Its in ‘cool mink’, which is a silvery, purply matalic shade and its just gorgeous. I’ve seen bloggers and youtubers saying these are a great cheap dupe for the By Terry Ombre Blackstars’, at only £8 you definitely can’t go wrong. Its super creamy and has great staying power. Probably one of my favourites from No7, definitely worth a try! Last but certainly not least, No7 Stay Perfect Eyeshadow. Again, this is one of my favourites, I love this so much. The shade is beautiful, a shimmer metallic purply brown shade. Its perfect for days where you don’t want to much make up, its also very blendable and works well with other neutral shades. I have a mini version I believe, however they retail for £7 each. Pretty reasonable for a well pigmented eyeshadow. I don’t know what colour this is in sadly, I want to say ‘mink’ but I’m not 100% sure. Love this product. Have you tried anything from No7?